Belfast’s answer to Wallace and Gromit could emerge over three days of workshops involving one of the model makers behind the Oscar winning films. Jan Sanger, one of the world’s most celebrated animation designers and model makers, will deliver a three-day series of practical workshops for young animators at the University of Ulster. She will also present a talk to students who are interested in a career in animation. The event is part of the Ulster Festival of Art and Design, sponsored by Carson McDowell, which runs at the University of Ulster’s Belfast campus until Saturday 19 June. Jan has been involved in 3D animation and film-making for more than 20 years. 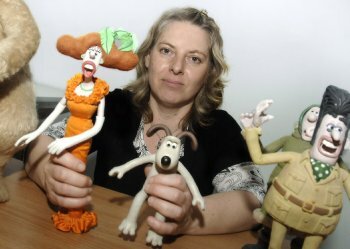 In 1989 she became head of the model making department at Aardman Animation where she was the model making production designer on their award-winning feature film The Curse of the Were-Rabbit as well as on their short films A Grand Day Out, The Wrong Trousers and A Close Shave. The plasticine stars of the show, Wallace an absent-minded inventor and Gromit, his anthropomorphic dog, have since become icons of popular modern British culture. Students will take part in a three-day series of practical workshops with the world renowned designer where they will be able to try model making for themselves as well having a go at set and props building for film and animation. They will become part of the crew that creates a story board, designs and makes the characters and set; films, lights and edits their very own short film. Jan Sanger’s workshops will take place from 10am – 4.30pm beginning on Thursday 17 June and running until Saturday 19 June at the University of Ulster’s Belfast campus. The Ulster Festival of Art and Design runs until Saturday 19 June 2010. For further Festival details visit: www.ulsterfestival.com.